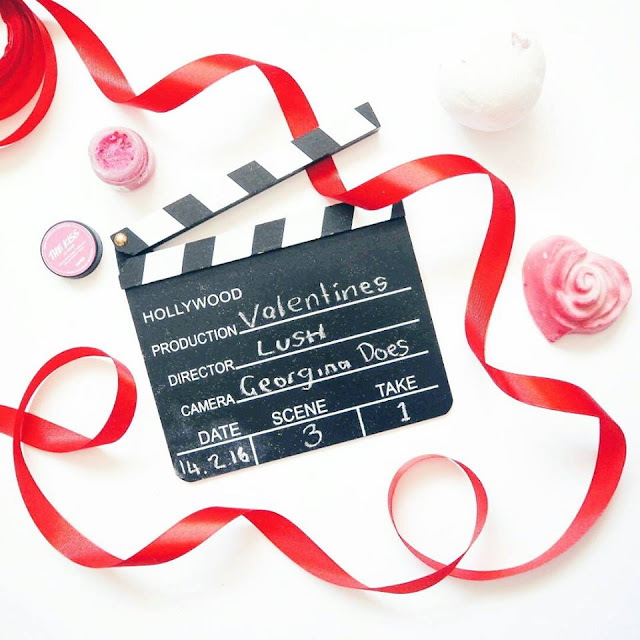 I have just a few new LUSH products to share with you today in the lead up to valentine's weekend! Andrew and I actually have our big plans next weekend because it was half the price so this week we just have a nice meal booked which hopefully means lots of time to have a pamper and a nice bath beforehand! I have three products from the brand here. Firstly there is the Lover Lamp bath bomb which is brand new for 2016! Its one of their £3.95 big, round bath bombs which is totally white apart from a few big red cocoa butter hearts which are embedded inside it.There are also lots of little red paper hearts hidden inside which come out later on. As the bath bomb fizzes away in the water, the cocoa butter hearts come flying out and melt adding a touch of moisture to the water. The bath bomb is made with Fair Trade Organic Cocoa Butter, Fair Trade Vanilla Absolute and Sweet Brazillian Orange Oil which makes it smell just like a terry chocolate orange. Perfect. The Kiss lip scrub is back again this year and is a lip scrub. It's a super bright pink colour and also has little love hearts in it. Cute. Made with fine sea salt, caster sugar and Fair Trade cocoa butter and a touch of almond and mandarin oils. I am a big lover or citrusy scents so I love this. Use it to exfoliate you lips keeping them smooth. Lastly I have the Roses All The Way bar of soap which is so pretty and kinda interesting with its swirly design. Based around Alice in Wonderland, the pink exterior fades to white as you start to use it. It's subtly rose scented but very delicate. Super moisturizing and starts to melt in the heat of your hands if you hold it for too long. It also contains rapeseed and coconut oil to keep your skin soft and smooth. Are You Stocked Up For This Weekend?